For more than 1000 years, the Camino de Santiago [the Way of St. James] has been a pilgrimage route from the foothills of the Pyrennes, in southwestern France and northwestern Spain, to the cathedral of Santiago de Compostela on the Iberian Peninsula. In ancient times it was undertaken for spiritual cleansing or “losing time in Hell”. James was a fisherman on the Sea of Galilee and the 4th disciple recruited by Jesus. He was assigned to the Iberian Peninsula to spread “the word of God”. He made it as far as Galicia in northwestern Spain. Upon returning to the Holy Land he was tortured. Adding insult to injury, he was beheaded. Became a martyr. His body was secreted out of Jerusalem on a boat. Across the Mediterranean Sea, through the Straits of Gibraltar, along the Iberian coast, back to the shores of Galicia. His tomb became enshrined in the Cathedral of Santiago de Compostela. So began the third most important Christian pilgrimage in the Middle Ages, after Rome and Jerusalem. During the Renaissance and years of religious reformation [16th century] the Camino’s importance waned. It fell even more out of favor during the Age of Enlightenment [18th century]. Yet pilgrimages to Santiago de Compostela never stopped completely. Nowadays, the Camino is rocking in popularity. 262,459 certificates [Compostelas] were awarded in 2015. Pilgrims traveled by foot, bicycle, or horseback. Some in wheelchairs. In ancient times as well as today, travellers typically carry their provisions in a backpack, camp out, or sleep in hostels, retreating from normal life for days, weeks, or months. Usually their journey ends at the cathedral in Santiago. There is also another “way” to experience the Camino. In May 2014, I was part of a group of women who started where most people end–in the courtyard of the cathedral. We walked to the actual “ends of the earth” [Finisterre] on the Atlantic Ocean. We carried only a daypack with water and rain gear. Our worldly goods were transported to the next charming “casa rurales” [bed and breakfast] along the route. After hiking, we enjoyed a hot bath or shower, delicious Galician cuisine and wine, followed by restful sleep–in a bed. Our group came together through the joint venture of two American women, Sally and Sienna, who met in Spain while Sally was producing a documentary entitled, “Walking the Camino: Six Ways to Santiago”. In 2013 they began organizing small group trips to experience the Camino on a one week pilgrimage. The topography of Galicia is extremely hilly. It is also very rainy which keeps the landscape lush and green. And, in May, there were fields upon fields of pink foxglove. So much future heart medication growing wild. “Oreos” were spoken of frequently. I found out they were tiny barns of granite or shale stone built on mushroom like pedestals. Functioning as storage granaries in rural areas, they are mounted off the ground to deter rodents. Later, when I learned the Galician word was actually “hórreos”, I understood what they had in common with the name of a cookie. Absolutely nothing. But “oreos” is what I remember. Forewarned about the hilly terrain, I brought hiking sticks, which gave me a long rhythmic stride. So I was often by myself, up ahead, looking for trail markers [the yellow scallop shell or the painted yellow line] and discovering new terrain. 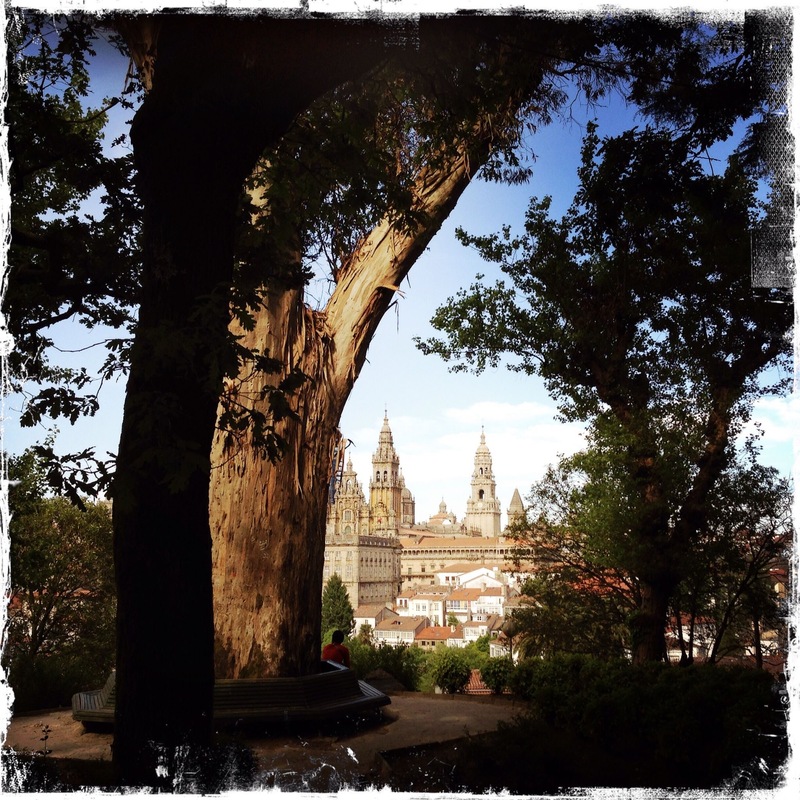 After the first day, I realized that hiking alone was going to be my experience on the Camino. Everyone goes on a journey for some reason. It’s often initiated during a moment of transition, a need to “walk through” personal issues, let go of the old, let in the new, or to simply break up routines. It might bubble up as a search for healing or forgiveness or a time to give thanks or to mark a special occasion. Perhaps the motivation is to meet new people, hear their stories, see new places, rediscover something forgotten or discover something new. Journeys can be the means for seeking creative inspiration, exercise, harmony with nature, penance, meditation, or delving into the spiritual. My own journeys are usually discovery seeking ones. They widen my perspective, feed curiosity, and replenish me with adventure. Those quiet hours in the hills, forests, villages, foxglove fields and countryside of Galicia brought real contentment. I was part of the changes in weather–the down pouring rain, looming storm clouds and sometimes present sun. I was entwined in the topography–the out of breath up-hills, the knee jarring down-hills and the blessed stretches of flat terrain in between. I was lost in thought about the history and natural beauty of this part of the world. It was impossible not to feel connected to and wonder about others who had walked the same trail, taken the same pilgrimage, through millenniums. Evening meals were social bonding time. We were treated to delicious regional cuisine including famous Galician wines. Arroz con calamares [rice with squid], zamburiñas [scallops in shells], and, once, a giant fried prehistoric style fish, which looked ominous but melted in the mouth. A uniquely Galician tradition, the queimada ceremony, was performed just for us. Queimada is made from a special Spanish liqueur distilled from grapes, flavored with spices, herbs, sugar, lemon peel and coffee beans. The ingredients are put together into a clay pot, set on fire and allowed to burn slowly. The whole concoction is stirred frequently by lifting a ladle of flaming liquid and pouring it back into the pot. When the flame burns blue, it is ready to serve in ceramic cups. There is a recitation chanted as the queimada burns–to purify the drink and to share it with the souls of family and friends not present to enjoy it. Special powers are conferred on the queimada and to those drinking it. We didn’t experience anything supernatural, but there was a lot of infectious laughter and animated conversation after a long hiking day. Sound sleep soon followed. Upon reaching the cliff at the end of the world on Cape Finisterre, we saw blackened remains of burned clothes and shoes on the rocks. It’s a tradition for those who venture all the way. None of us were moved to do the same. We picked up a stone to throw into the sea at journey’s end–giving it the name of something to let go of. The odd thing was, I couldn’t bring myself to throw my stone away. I kept touching it in my pocket and wondering about the hesitation. My friend Margaret suggested that I wasn’t ready to let go. There was a reason I needed to save that energy for something else. She was perceptive. And right. Three weeks later, in June 2014, this blog was born. I discovered white markings on the stone that looked like a face. I still have it. Typically, all pilgrimages have a fixed end point. But they begin wherever you start. Some of the photos in this story are courtesy of Nina Cooper or Teresa Goodwin.